What's that boiling across the horizon with all the crackling power of late-summer thunderstorm? It's only Tuesday Funk, with a September lineup that will ionize your intellect and electrocute your emotions. For our next outing at Hopleaf, you can look forward to bottled literary lightning from the likes of Edison Blake, Carissa DiGiovanni, AD Jameson, Noreen Natale, and Naomi Buck Palagi, plus another patented Poem By Bill. Oh, and don't forget the dozens of varieties of good, cold beer! Tuesday Funk convenes Tuesday, September 6, 2011, 7:30 pm, in the upstairs lounge at Hopleaf, 5148 N. Clark St., Chicago. Arrive early, stake out a table in the upper room, and grab a beer from John at the cash-only bar. We start seating at 7:00 pm and no earlier. Admission is always free, but you must be 21 or older. And come early or stay afterward for some great Belgian-style food downstairs. 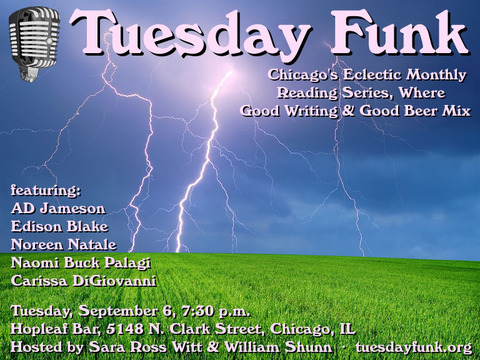 Please bring plenty of friends, and become a fan of Tuesday Funk on Facebook so you never miss an invitation to our readings, which later this fall will feature the likes of CP Chang, Hanna Martine, Patricia Ann McNair, Erin Shea Smith, Matthew Darst, Liz Baudler, and yours truly, among many others. You won't want to miss a single reading! This page is an archive of recent entries in the Humor category. Hopleaf is the previous category. Likes is the next category.